In the recently conducted first quarter meeting of the Regional Disaster Risk Reduction Management Council, Dr. Rosario Pamintuan, head of the Regional Epidemiology and Surveillance Unit of the DOH Region 1, said from January 1, 2019 to March 23, 2019, there have been 1,160 measles cases recorded including 28 fatalities. But these patients are not the only ones at risk. Mothers treating their children in hospitals are now threatened by the same virus. 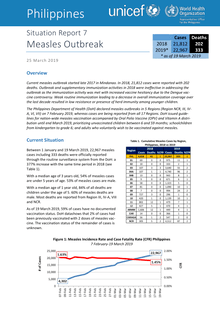 Current measles outbreak started late 2017 in Mindanao. In 2018, 20,827 cases were reported with 199 deaths. 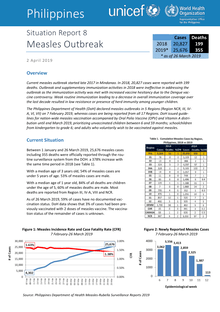 Outbreak and supplementary immunization activities in 2018 were ineffective in addressing the outbreak as the immunization activity was met with increased vaccine hesitancy due to the Dengue vaccine controversy. Weak routine immunization leading to a decrease in overall immunization coverage over the last decade resulted in low resistance or presence of herd immunity among younger children. Measles outbreaks in the World Health Organization (WHO) Western Pacific Region are putting babies, children and young people at risk and threatening progress towards wiping out the disease. CITY OF SAN FERNANDO, Pampanga, Mar 28 (PIA) -- Department of Health (DOH) has seen a steady decrease of measles cases in Central Luzon in the past three to four weeks. “Cumulatively, if we add the cases, they are increasing; but daily tally of cases now shows a steady decrease. Hopefully, it will go back to the low levels like the ones we had last year,” DOH Regional Epidemiology and Surveillance Unit (RESU) Head Dr. Jessie Fantone said. BAGUIO CITY, March 26 (PIA) - - The Department of Health reminds the public to clean up possible mosquito breeding sites in their homes and surroundings with Dengue cases still in the upward trend. 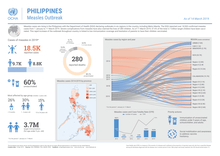 DOH – Cordillera Regional Epidemiology Surveillance Unit head Geeny Anne Austria, in a Kapihan media forum Wednesday, reported that from January 1 to March 9, there were 1,267 Dengue suspect cases recorded in the region, a 73 percent increase compared to the 732 cases recorded during the same period last year. Measles is a highly contagious respiratory disease caused by a virus. It is transferred from person-to-person by sneezing, coughing, and close personal contact. Its signs and symptoms include cough, runny nose, red eyes/conjunctivitis, fever, skin rashes lasting for more than three (3) days. 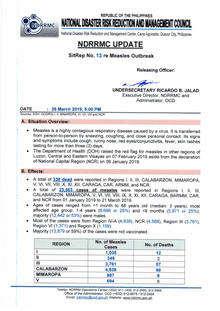 The Department of Health (DOH) raised the red flag for measles in other regions of Luzon, Central and Eastern Visayas on 07 February 2019 aside from the declaration of National Capital Region (NCR) on 06 January 2019. 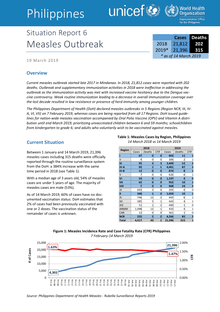 Current measles outbreak started late 2017 in Mindanao. In 2018, 21,812 cases were reported with 202 deaths. Outbreak and supplementary immunization activities in 2018 were ineffective in addressing the outbreak as the immunization activity was met with increased vaccine hesitancy due to the Dengue vac-cine controversy. Weak routine immunization leading to a decrease in overall immunization coverage over the last decade resulted in low resistance or presence of herd immunity among younger children. 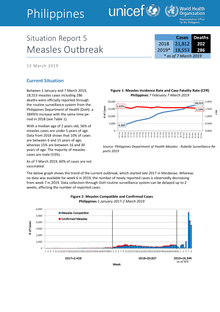 Manila / Kuala Lumpur / Geneva, 14 March 2019 - An estimated 3.7 million children under five in the Philippines are at risk during a measles outbreak that has already claimed 286 lives, most of them children or babies, the Red Cross is warning. 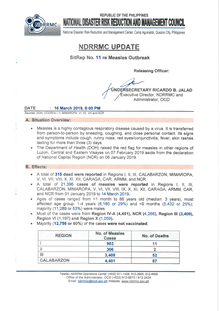 PALO, Leyte, March 13 (PIA) -- A top official of the Department of Health Regional Office 8 (DOH-8) on Monday reported a decreasing trend in measles cases in Eastern Visayas due to the intensified immunization activities. In a press briefing at the DOH regional office here, Assistant Regional Director Exuperia Sabalberino said their immunization program already covered 50 percent of the 192,056 children population aged 6 to 59 months old, targeted for the outbreak immunization response. 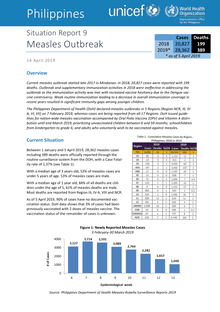 Current Situation Between 1 January and 7 March 2019, 18,553 measles cases including 286 deaths were officially reported through the routine surveillance system from the Philippines Department of Health (DoH): a 384%% increase with the same time period in 2018 (see Table 1). With a median age of 2 years old, 56% of measles cases are under 5 years of age.